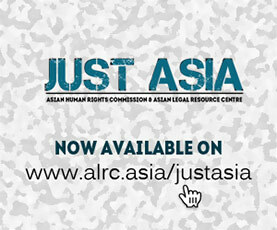 The Asian Human Rights Commission (AHRC) has received information that a Hong Kong based Nepali investigative journalist and NepalKhabar Hong Kong Editor, Mr. JB Pun Magar, has been attacked and threatened for writing on issues relating to the Nepalese community residing in Hong Kong. Mr. Komal Gurung (Thapa), a Hong Kong based businessperson has been targeting JB and other Hong Kong based journalists for publishing news on his business affairs. On 28 June 2017, a group of Hong Kong Nepalese journalists and entrepreneurs were having a chat in front of a Cathy Pacific check-in counter of Departure Hall H at Hong Kong’s Chek Lap Kok International Airport. They were seeing off a Nepalese social entrepreneur Dr. Mahabir Pun, who was on a visit to Hong Kong. Dr. Mahabir Pun and other business people came to Hong Kong to attend a Nepal Trade Fair organized by the Consulate General of Nepal in Hong Kong and Hong Kong Nepalese Business Association. Mr. Komal Gurung suddenly showed up there, and shook hands with everyone. When JB Pun Magar extended his hand, he threw it away and started hurling abusive language at him. JB Pun had written two stories about Mr. Komal Gurung’s activities in the Nepalese community in Hong Kong. One was about a court case Gurung had filed against three other Nepalese community journalists, Mr. Bikram Gurung (a photojournalist), Mr. Kisan Rai (editor of Everest Weekly), and Mr. Tulsi Rana (editor of hongkongnepali.com). After JB published the story, Mr. Komal Gurung called him in the first week of June 2017 and shouted, “Why are you becoming over smart?” Subsequently, JB started receiving insulting messages and threats on Facebook, from a fake ID ‘Ishwor Gurung’, where the person was providing details of his working history, residential address, and names of his family members. When JB found that it is a fake FB identity, he wrote a second story about this. At the airport on June 28, Komal Gurung stepped up to attack JB for writing those stories. Then, he threatened JB saying that he will attack him physically anywhere in Hong Kong. The other Nepalese protected JB, and after a while, Komal’s associates took him away. However, when JB was returning to his office in a car belonging to Mr. Gyan Thapa, Komal Gurung called on Mr. Gyan Thapa’s number and insulted him again. Since Komal frequently attacked Nepalese journalists such as Mr. Jagat Ambu Gurung, Mr. Kisan Rai, Mr. Bikram Gurung, Mr. Tulsi Rana and other business people, JB first reported the case to the Nepal Journalist Association Hong Kong. The Association released a press statement condemning the “attack and threat” on journalists on the same night. JB then went to the Tsim Sha Tsui Police Station at 11 p.m. and tried to report the case to the Police. JB was referred to a CID officer, who told him that he would call him again for a detailed report. On July 2 at 6:55 p.m., while JB was sitting in his office (Room A, 1/F, Civic Commercial Building, 165-167 Woosung Street, Jordan) and editing some news stories, an unknown caller rang him, and threatened him with physical attack and violence. The caller even warned JB that they would chase him away from Hong Kong if he continued writing stories about Komal Gurung. Furthermore, JB’s wife, who is in Nepal now, has also received threatening calls at night from many unknown callers. 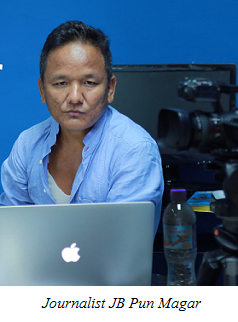 The AHRC has learnt that Komal Gurung mobilized his associates to track JB’s whereabouts for possible attack. Due to these incidents, and due to the shady background of the alleged perpetrator, Nepalese journalists including JB Pun are feeling very insecure in Hong Kong. As Hong Kong has ensured the right to free speech and freedom of the press, the AHRC calls on the HKSAR government to do the needful, and ensure the safety and security of journalists raising voices of the Nepalese ethnic community in Hong Kong.